Alkenstar, City of Smog, is a bastion of civilization in the magic-warped region known as the Mana Wastes. Its ingenious citizens survive in the treacherous Spellscar Desert with the help of canny inventions like guns and clockwork automatons, but now their construct protectors have begun to run amok within the city. It falls to the PCs to venture beyond the city walls to find the source of their strange behaviour. Will they uncover the mastermind behind the plot and put an end to this madness, or will they instead fall victim to the primal magic and savage tribes of Mana Wastes mutants that beleaguer the city? 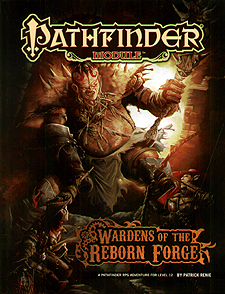 Wardens of the Reborn Forge is a deluxe super-adventure for 12th-level characters, and includes 64 action -packed pagers of adventure filled with mechanical machinations, new monsters, a beautiful double-sided and full-colour poster map of Alkenstar, and an important miniatures-scale battleground. Players can expect to reach 15th level by the time they complete this epic adventure - if they manage to survive the machinations of the clockwork constructions of the reborn forge!